The cookbook that makes using your Instant Pot easier than ever! The first cookbook dedicated to non-paleo gluten-free recipes for the hottest kitchen appliance: the Instant Pot—with 175 easy-to-make gluten-free recipes and photographs throughout! This book shows you how you can use the hottest kitchen appliance right now—the Instant Pot—to create gluten-free meals that are quick, easy, and most importantly, delicious. With 175 gluten-free recipes and photographs throughout, this cookbook is a must-have for Instant Pot fans who follow a gluten-free diet due to celiac disease, gluten intolerance, wheat allergies, or simply for health reasons. You’ll learn how to make satisfying, whole-food dishes for every meal from breakfast to dinner, snacks to desserts. You’ll also find an easy-to-understand overview of the Instant Pot including what all those buttons on your Instant Pot do, how to release the pressure from the Instant Pot when your cooking time is up, how to keep your Instant Pot clean, and more. The “I Love My Instant Pot” Gluten-Free Recipe Book is perfect for instant pot fans who follow a gluten-free diet or anyone who wants fast, delicious meals the whole family will love. Michelle Fagone is a recipe developer and food blogger. On her site, CavegirlCuisine.com she shares recipes and knowledge about the health benefits of cooking with local, fresh, non-contaminated foods. Cavegirl Cuisine was named one of the Top 50 Paleo Blogs of 2012 by the Institute for the Psychology of Eating. She lives in Louisville, Kentucky. She is the author of The “I Love My Instant Pot” Paleo Recipe Book. 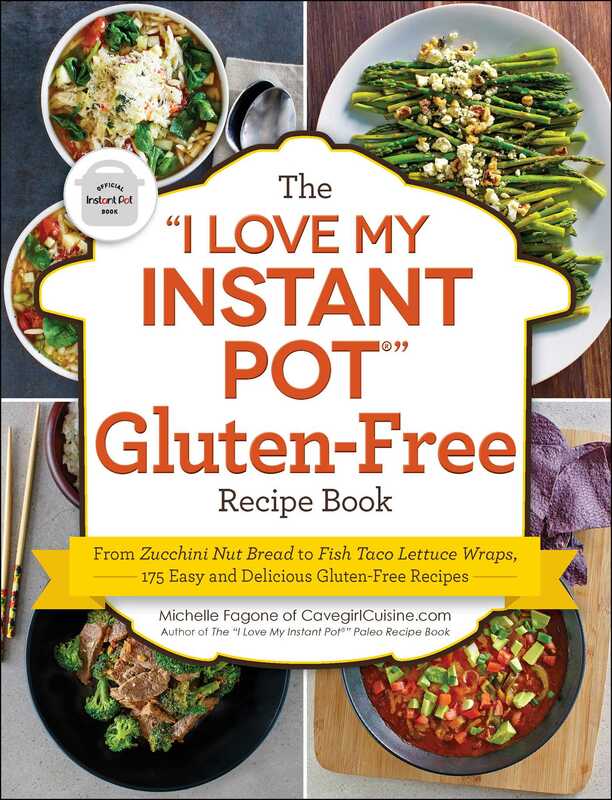 "From zucchini nut bread to a delicious-sounding mash-up of potato skins and Reuben sandwiches, The I Love My Instant Pot Gluten-Free Recipe Book by Michelle Fagone has creative recipes for anyone following a gluten-free diet." "Total win on a busy winter night."